Which OnePlus 5 color do you prefer? So, the OnePlus 5 is finally available for purchase. The pre-sale period is over and there's no invitation shenanigans to put a spoke in your wheel. Well, the Flagship Killer has grown quite a lot in price as well, far from the once alluring $299 price tag, and up to $479 right now. But it's still quite the bargain. As you probably know, you can get the OnePlus 5 in one of two variants — either the Slate Gray, which “only” has 6 GB of RAM and 64 GB of storage, or the trendy Midnight Black, supercharged with 8 GB of RAM and 128 GB of Storage. Obviously, OnePlus considers the matte black to be more of a premium finish. But let's put the specs aside and talk color only — do you prefer any of these two paintjobs more than the other? Or do you think there's not much difference? Or would you rather you had a different color choice entirely? The way that the midnight black appears to be seamless is beautiful to me. 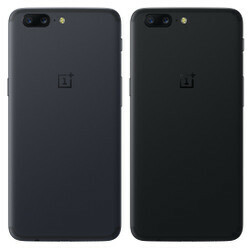 Midnight black definitely looks better, but available in more expensive option only. OP is hoping that people will like black color better and thus pay more for expensive option. In fact looks like people won't buy neither of them: grey one - because they don't like it and black one because it's too expensive and paying just a little more they will get much better option from A brand (Galaxy S8 is available at around $ 624 in USA). Let alone LG G6 on US amazon at around $467. True - LG has SD 821 and 4 Gb of RAM but however - water resistant, has better sound, better camera, modern look and bullet proof design. Huawei P10 available for around $ 550 and it's a great phone as well. Last year HTC 10 is close to $400 and now became an excellent value. So there is a lot of competition for OP5. I think they made a mistake offering midnight black color for more expensive option only. Gray, unless specs are taken into account. I'd like to see an actual color like red.